I recently talked to US News & World Report about the use of high-yield "junk bonds" in investment portfolios. You can read the article here, but very few of my actual thoughts made it to print. From what I did say, you can see I'm not a fan. What don't I like about junk bonds? 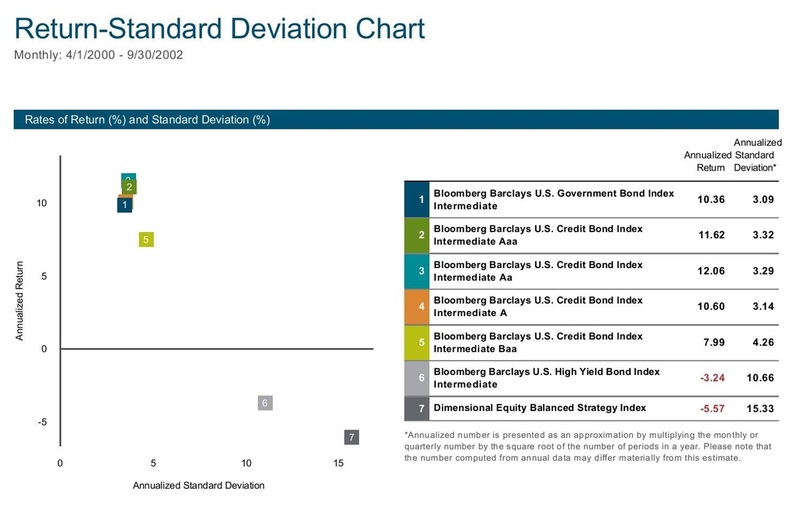 First, what are junk bonds, or "high yield" bonds as they are often labeled? They're just bonds with ratings below "investment grade," which range from AAA-BBB. 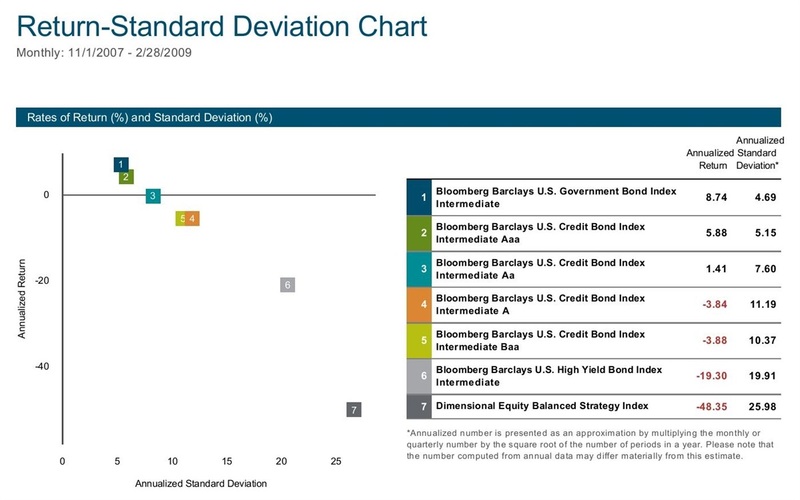 Junk bonds are rated BB and below. These are the bonds of the riskiest companies in the marketplace -- they have the lowest credit ratings and have to offer the highest yields to attract investment. The high yields sound nice but realize that's just compensation for the higher probability that the company will either miss some interest payments or default altogether. There's always a chance that an investor in a junk bond will not receive full repayment of principal at the end of the term. It's true, as you progress from government bonds to corporate bonds to junk bonds that returns have gone up, but so has the investment risk; precisely what we'd expect in an efficient market. 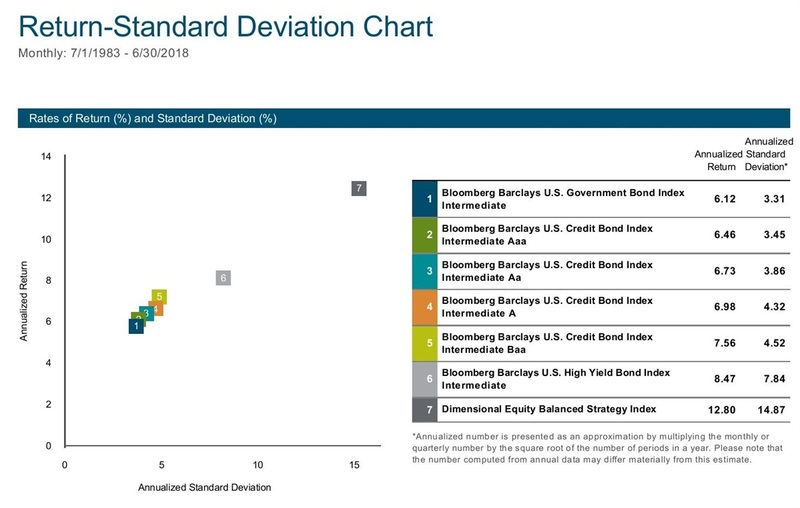 In the chart below, I've listed the returns on each bond credit bucket (government, AAA, AA, A, and BBB) including junk bonds (see #6 in GREY). For comparison purposes, I've also included a globally diversified stock index -- the DFA Equity Balanced Strategy Index. Junk bonds don't look like bonds at all; they plot in between traditional investment grade bonds and stocks on the risk/return scale. All segments of the investment grade bond market had positive returns, with AAA, AA, and A-rated bonds outperforming government bonds. BBB (Baa)-rated bonds underperformed higher-quality bonds but still had positive returns. Junk bonds, on the other hand, lost -3.2% per year, almost as much as the -5.6% annualized loss on stocks (the DFA Equity Balanced Strategy). How about 2007-2009? This stretch saw a severe bear market and entailed a credit crisis as well, so it's an interesting period to observe relative returns. This time we find even lower-quality investment grade bonds experienced modest declines. AA-rated bonds barely squeezed out a positive return, and A and BBB-rated bonds lost -3.8% and -3.9% respectively. Neither of these losses compared to the -19.3% per year loss for junk bonds -- this was about half the loss on a 100% stock portfolio. WHY NOT JUST HOLD STOCKS AND INVESTMENT GRADE BONDS? What we've seen so far is that junk bonds don't behave like traditional bonds -- they're much riskier but have also offered higher returns. In the first chart, we see 1% to 1.5% per year higher returns for junk bonds compared to the riskiest A/BBB-rated investment grade bonds, but with double the risk; they reliably lose value in bear markets. The sixth row in the chart above lists the 1983-2018 compound returns for the traditional 60/40 stock and bond portfolio compared to a junk bond index. 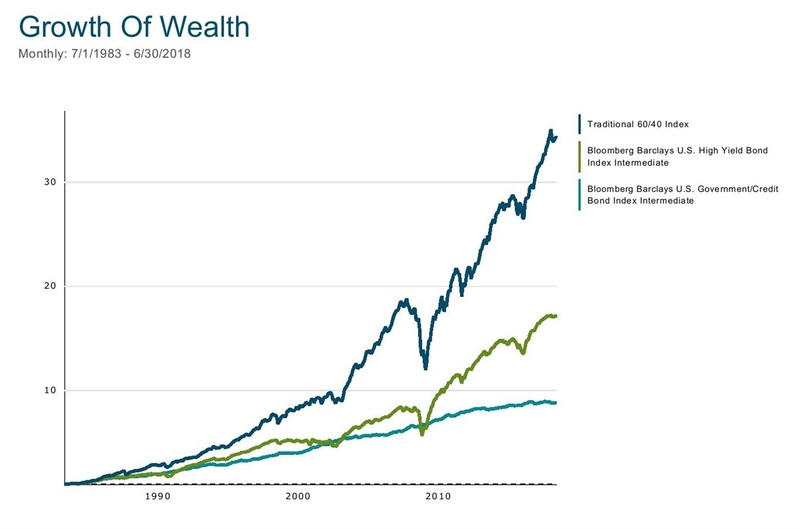 The difference is about 2% per year higher returns to the 60/40 index, which resulted in nearly double the wealth ($1 grew to $34.28 compared to $17.21). That's a significant difference in favor of a traditional stock and high-quality bond portfolio. 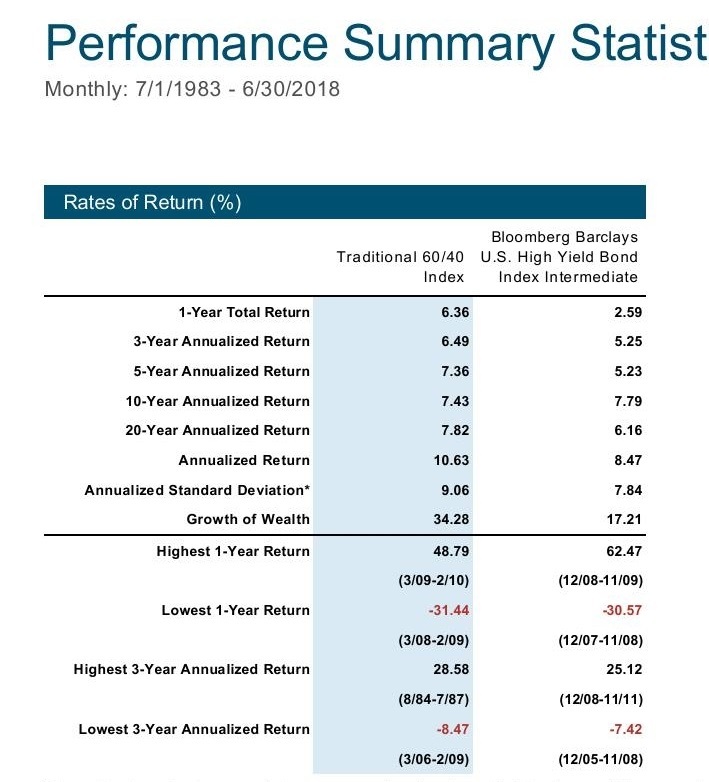 Looking at the worst 1-year and 3-year periods, it appears as though that higher return has not come with significantly greater short-term risk. Looking closer at the long-term growth of $1, we find that over the entire period junk bonds have indeed outperformed traditional investment grade bonds. However, all of that outperformance has come since 2010. During the 2002 and 2008 bear markets, junk bonds lost so much value that they temporarily dipped below investment grade bonds in total return despite significantly greater risk! The difference between the 60/40 mix and junk bonds, on the other hand, was never in question -- the spread has been consistent. Finally, there's one other advantage to avoiding junk bonds and sticking with a traditional stock and investment grade bond portfolio that real-world investors might want to consider: tax efficiency. The return on junk bonds comes exclusively from the bond interest, which is taxed as ordinary income. Stock returns, on the other hand, come in the form of appreciation and tax-preferenced dividends (typically at long-term capital gains rates). Using investment-grade bonds results in less portfolio tax liability (because you're holding fewer bonds). Investment grade bonds are also more tax efficient than junk bonds because of their lower yields. Over the last 15 years, the Vanguard High-Yield Corporate Bond Fund lost -2.5% per year to taxes, a 60/40 combination of the DFA Equity Balanced Strategy (using tax-managed mutual funds) and the DFA Five-Year Global Bond fund lost only -0.8% per year. That's almost an additional 2% a year in after-tax benefits (-0.8% versus -2.5%), on top of the historical 2% a year risk-adjusted return advantage for a traditional stock/bond portfolio! Locating the bond portion of the 60/40 (or as much of it as possible) in an IRA account would lower taxes further (and help to reduce future required minimum distributions). Another tax-savings technique entails using a tax-free municipal bond fund (since April 2015 inception, the DFA Municipal Bond Fund has lost -0.1% per year to taxes compared to -0.7% per year for the DFA Five-Year Global Bond Fund). There you have it -- I was quoted in the article as saying you should "not just walk, but run from junk bonds." Now you know why!